Imagine improving the efficiency of your Quality and GxP processes while ensuring regulatory compliance. Sound impossible? Well the good news is that it is possible thanks to Quality Process Management Software from Ennov. Regulated companies must control their Quality processes for regulatory compliance reasons, while at the same time, make them as efficient and effective as possible to decrease production times and remain competitive. Manual, paper-based processes can get bogged down and are very hard to manage, track and control. They are also slow, error prone and notoriously difficult to scale and deploy globally. If these challenges seem all too familiar, our comprehensive fully-integrated Quality Process Management Software, Ennov QMS, can help streamline your Quality operations, ensure compliance and increase your overall efficiency. 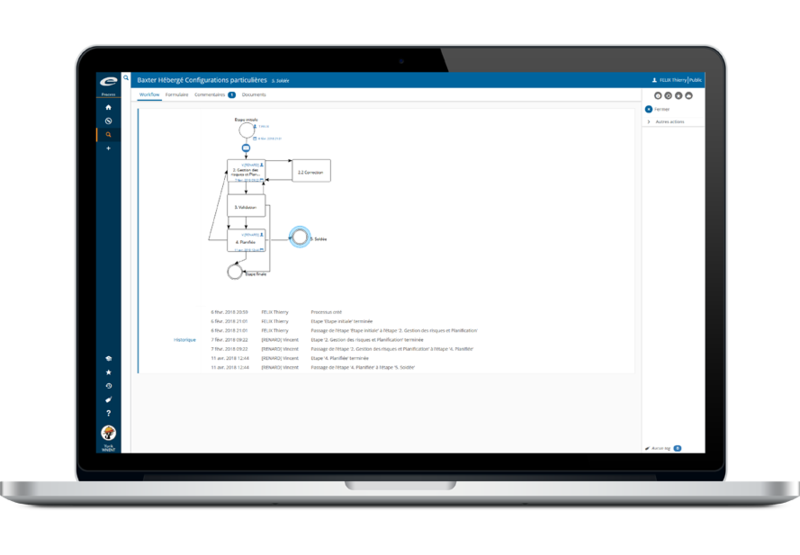 Ennov Process allows you to automate your Quality processes and enforce the activities, participants and traceability required by your SOPs using our visual form builder and graphical workflow modeling utilities. Ad hoc processes or those that remain stalled for months are a thing of the past. The “smart” data form associated with the workflow retains all of the information required at each process step and provides each participant with the information they need, in the proper context, to complete their tasks on time. Managers can monitor any workflow, visualize pending and completed tasks and intervene when tasks become delayed. Automatic alerts, email notifications and escalations keep your processes on schedule and your business running smoothly. Our customers use Ennov QMS to support a wide variety of Quality process management needs including CAPAs, Deviations, Non Conformances, Customer Complaints, Change Controls, Audits and more. Ennov QMS’ high degree of configurability and seamless integration with our Enterprise Document Management software (Ennov Doc), our innovative Learning Management software (Ennov Training) and our data visualization and reporting tools (Ennov Report) allows them the flexibility to meet their internal Quality standards as well as those of their business partners. As an added benefit, Ennov QMS fully complies with FDA’s 21 CFR part 11 requirements (electronic signature, audit trail, records management), making it a perfect fit for regulated industries such as pharmaceutical, biotechnology, animal health, medical device and others.